We should better take note of this particular verse from the Vaisnava acaryas like Jiva Gosvami instead of following the interpretation of unauthorized persons who deride Krsna. Despite the transcendental qualities of Lord Krsna's body, its full bliss and knowledge, there are many so-called scholars and commentators of Bhagavad-gita who deride Krsna as an ordinary man. The scholar may be born an extraordinary man due to his previous good work, but this conception of Sri Krsna is due to a poor fund of knowledge. Therefore he is called mudha, for only foolish persons consider Krsna to be an ordinary human being because they do not know the confidential activities of the Supreme Lord and His different energies. They do not know that Krsna's body is a symbol of complete knowledge and bliss, that He is the proprietor of everything that be and that He can award liberation to anyone. Because they do not know that Krsna has so many transcendental qualifications, they deride Him. Nor do they know that the appearance of the Supreme Personality of Godhead in this material world is a manifestation of His internal energy. He is the master of the material energy. As has been explained in several places (mama maya duratyaya), He claims that the material energy, although very powerful, is under His control, and whoever surrenders unto Him can get out of the control of this material energy. If a soul surrendered to Krsna can get out of the influence of material energy, then how can the Supreme Lord, who conducts the creation, maintenance and annihilation of the whole cosmic nature, have a material body like us? So this conception of Krsna is complete foolishness. Foolish persons, however, cannot conceive that the Personality of Godhead, Krsna, appearing just like an ordinary man, can be the controller of all the atoms and of the gigantic manifestation of the universal form. The biggest and the minutest are beyond their conception, so they cannot imagine that a form like that of a human being can simultaneously control the infinite and the minute. Actually although He is controlling the infinite and the finite, He is apart from all this manifestation. It is clearly stated concerning His yogam aisvaram, His inconceivable transcendental energy, that He can control the infinite and the finite simultaneously and that He can remain aloof from them. Although the foolish cannot imagine how Krsna, who appears just like a human being, can control the infinite and the finite, those who are pure devotees accept this, for they know that Krsna is the Supreme Personality of Godhead. Therefore they completely surrender unto Him and engage in Krsna consciousness, devotional service of the Lord. There are many controversies amongst the impersonalists and the personalists about the Lord's appearance as a human being. But if we consult Bhagavad-gita and Srimad-Bhagavatam, the authoritative texts for understanding the science of Krsna, then we can understand that Krsna is the Supreme Personality of Godhead. He is not an ordinary man, although He appeared on this earth as an ordinary human. In the Srimad-Bhagavatam, First Canto, First Chapter, when the sages inquire about the activities of Krsna, it is stated that His appearance as a man bewilders the foolish. No human being could perform the wonderful acts that Krsna performed while He was present on this earth. When Krsna appeared before His father and mother, Vasudeva and Devaki, He appeared with four hands, but after the prayers of the parents, He transformed Himself into an ordinary child. His appearance as an ordinary human being is one of the features of His transcendental body. In the Eleventh Chapter of the Gita also it is stated, tenaiva rupena etc. Arjuna prayed to see again that form of four hands, and when Krsna was thus petitioned by Arjuna, He again assumed His original form. All these different features of the Supreme Lord are certainly not those of an ordinary human being. Some of those who deride Krsna, who are infected with the Mayavadi philosophy, quote the following verse from the Srimad-Bhagavatam to prove that Krsna is just an ordinary man. Aham sarvesu bhutesu bhutatmavasthitah sada: "The Supreme is present in every living entity." (Bhag. 3.29.21) We should better take note of this particular verse from the Vaisnava acaryas like Jiva Gosvami instead of following the interpretation of unauthorized persons who deride Krsna. Jiva Gosvami, commenting on this verse, says that Krsna, in His plenary expansion as Paramatma, is situated in the moving and the nonmoving entities as the Supersoul, so any neophyte devotee who simply gives his attention to the arca-murti, the form of the Supreme Lord in the temple, and does not respect other living entities is uselessly worshiping the form of the Lord in the temple. There are three kinds of devotees of the Lord, and the neophyte is in the lowest stage. The neophyte devotee gives more attention to the Deity in the temple than to other devotees, so Jiva Gosvami warns that this sort of mentality should be corrected. A devotee should see that Krsna is present in everyone's heart as Paramatma; therefore every body is the embodiment or the temple of the Supreme Lord, and as such, as one offers respect to the temple of the Lord, he should similarly properly respect each and every body in whom the Paramatma dwells. Everyone should therefore be given proper respect and should not be neglected. There are also many impersonalists who deride temple worship. They say that since God is everywhere, why should one restrict himself to temple worship? But if God is everywhere, is He not in the temple or in the Deity? Although the personalist and the impersonalist will fight with one another perpetually, a perfect devotee in Krsna consciousness knows that although Krsna is the Supreme Personality, He is all-pervading, as is confirmed in the Brahma-samhita. Although His personal abode is Goloka Vrndavana and He is always staying there, still, by His different manifestations of energy and by His plenary expansion, He is present everywhere in all parts of the material and spiritual creations. bhāraḥ—a great burden; param—heavy; paṭṭa—silk; kirīṭa—turban; juṣṭam—dressed with; api—even; uttama—upper; aṅgam—parts of the body; na—never; namet—bow down; mukundam—Lord Kṛṣṇa, the deliverer; śāvau—dead bodies; karau—hands; no—do not; kurute—do; saparyām—worshiping; hareḥ—of the Personality of Godhead; lasat—glittering; kāñcana—made of gold; kaṅkaṇau—bangles; vā—even though. The upper portion of the body, though crowned with a silk turban, is only a heavy burden if not bowed down before the Personality of Godhead who can award mukti [freedom]. And the hands, though decorated with glittering bangles, are like those of a dead man if not engaged in the service of the Personality of Godhead Hari. As stated hereinbefore, there are three kinds of devotees of the Lord. The first-class devotee does not at all see anyone who is not in the service of the Lord, but the second-class devotee makes distinctions between devotees and nondevotees. The second-class devotees are therefore meant for preaching work, and as referred to in the above verse, they must loudly preach the glories of the Lord. The second-class devotee accepts disciples from the section of third-class devotees or nondevotees. Sometimes the first-class devotee also comes down to the category of the second-class devotee for preaching work. But the common man, who is expected to become at least a third-class devotee, is advised herein to visit the temple of the Lord and bow down before the Deity, even though he may be a very rich man or even a king with a silk turban or crown. The Lord is the Lord of everyone, including the great kings and emperors, and men who are rich in the estimation of mundane people must therefore make it a point to visit the temple of Lord Śrī Kṛṣṇa and regularly bow down before the Deity. The Lord in the temple in the worshipable form is never to be considered to be made of stone or wood, for the Lord in His arcā incarnation as the Deity in the temple shows immense favor to the fallen souls by His auspicious presence. By the hearing process, as mentioned hereinbefore, this realization of the presence of the Lord in the temple is made possible. As such, the first process in the routine work of devotional service-hearing-is the essential point. Hearing by all classes of devotees from the authentic sources like Bhagavad-gītā and Śrīmad-Bhāgavatam is essential. The common man who is puffed up with his material position and does not bow down before the Deity of the Lord in the temple, or who defies temple worship without any knowledge of the science, must know that his so-called turban or crown will only succeed in further drowning him in the water of the ocean of material existence. A drowning man with a heavy weight on his head is sure to go down more swiftly than those who have no heavy weight. A foolish, puffed-up man defies the science of God and says that God has no meaning for him, but when he is in the grip of God's law and is caught by some disease like cerebral thrombosis, that godless man sinks into the ocean of nescience by the weight of his material acquisition. Advancement of material science without God consciousness is a heavy load on the head of human society, and so one must take heed of this great warning. The common man, if he has no time to worship the Lord, may at least engage his hands for a few seconds in washing or sweeping the Lord's temple. Mahārāja Pratāparudra, the greatly powerful king of Orissa, was always very busy with heavy state responsibilities, yet he made it a point to sweep the temple of Lord Jagannātha at Purī once a year during the festival of the Lord. The idea is that however important a man one may be he must accept the supremacy of the Supreme Lord. This God consciousness will help a man even in his material prosperity. Mahārāja Pratāparudra's subordination before Lord Jagannātha made him a powerful king, so much so that even the great Pathan in his time could not enter into Orissa on account of the powerful Mahārāja Pratāparudra. And at last Mahārāja Pratāparudra was graced by Lord Śrī Caitanya on the very grounds of his acceptance of subordination to the Lord of the universe. So even though a rich man's wife has glittering bangles made of gold on her hands, she must engage herself in rendering service to the Lord. from milk, you can save your children, you can save your diseased persons. Prabhupada:Go-raksya means protection to the cows. Instead of protection to the cows, they are killing the cows. How you can have perfect society? Cows must be protected. It is so important animal. It is giving the nectarean food milk, and from milk, you can save your children, you can save your diseased persons. And how it is that you take the cow's milk and send it for slaughterhouse. Oh, this is not, not at all human civilization. Here it is said go-raksya. You should give all protection to this important animal. Krsna does not say that you should protect the pigs and hogs or other animals. He especially meant the cows because cow is very important animal to the human society. If there are meat-eaters, they can kill other animals, but they should not kill the cow. This is, if you want actually perfect society. Krsi-go-raksya-vanijyam. And these persons, they let them produce enough food grains, and where there is no, there is scarcity of food grain, let them supply there. That is called trade. Vanijyam. Vanijyam. But because one happens to be animal, although it is national, still, it is sent to the slaughterhouse, because there is no Krsna consciousness. Prabhupada:So here Krsna says that advesta sarva-bhutanam. You should not be envious to any living entity. But the present civilization is to become envious, envious. I do not wish to criticize anyone, but this enviousness is the basis... This nationalism means... This is also enviousness. "Why foreigners will come here?" This is enviousness. Why not? Who is foreigner and who is national? Everyone is son of God. Why should you distinguish? But because there is no Krsna consciousness, this discrimination between man to man, animal to man, and so many discrimination... Even taking from the national point of view, national means anyone who is born in that country. But because one happens to be animal, although it is national, still, it is sent to the slaughterhouse, because there is no Krsna consciousness. If there is Krsna consciousness, then the government or the leaders would be equally favorable to the man, to the animals, to the trees, to the plants, to the insects, to the... Everyone. That is called krsna-bhakti or Krsna consciousness. Advesta sarva-bhutanam maitrah. Treat them just like your friend, maitrah. A devotee is friend to everyone. He does not want to kill even an ant or a mosquito. That is devotee, maitrah, to everyone friendly. Maitrah karunah. Karunah means kind. A devotee is kind to everyone. Prabhupada:The Vedic culture offers so many nice, delicious foods, and mostly they are made with milk products. But these so-called civilized people--they do not know. They kill the cows and throw the milk away to the hogs, and they are proud of their civilization--like jackals and vultures. Actually, this Krsna consciousness movement will transform the uncivilized people and bring the whole world to real civilization. 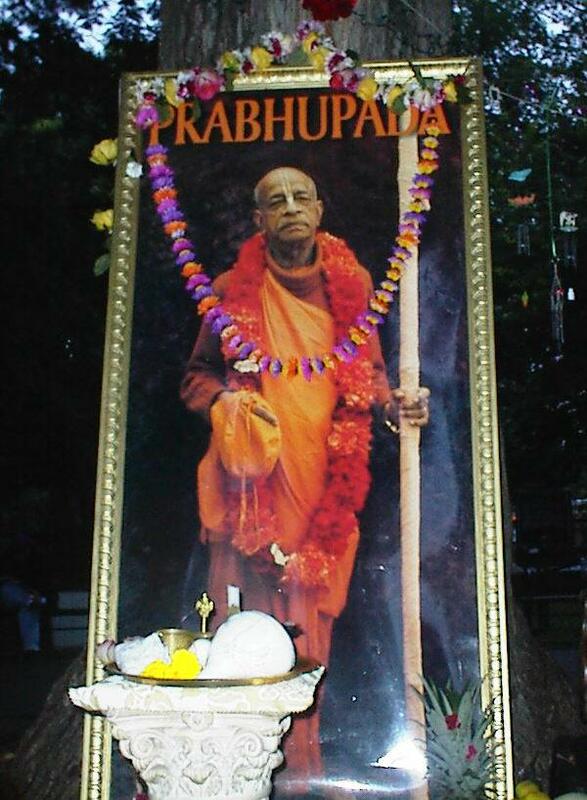 Prabhupada:These so-called civilized people--what is the difference between these rascals and vultures? The vultures also enjoy killing and then eating the dead body. "Make it dead and then enjoy"--people have become vultures. And their civilization is a vulture civilization. Animal-eaters--they're like jackals, vultures, dogs. Flesh is not proper food for human beings. Here in the Vedic culture is civilized food, human food: milk, fruit, vegetables, nuts, grains. Let them learn it. Uncivilized rogues, vultures, raksasas [demons]--and they're leaders. Therefore I say that today the leaders are all fourth-class men. And that is why the whole world is in a chaotic condition. We require learned spiritual teachers--first-class men--to lead. My disciples are training to become first-class men. If people will take our advice, then everything will be all right. What is the use of fourth-class men leading a confused and chaotic society? If I speak so frankly, people will be very angry. But basically, their leaders are all fourth class. First-class men are great devotees of the Lord, who can guide the administrators and the citizens through their words and practical example.